Documentary series. One London post office is reinvented as a hi-tech 'concept branch', while Whitstable residents try to stop their branch from moving. For nearly 400 years, the post office has been at the heart of our high streets, the centre of village life. But in recent years, keeping the doors of Britain's more than 11,000 post offices open has been costing the taxpayer millions, money the government has said it is no longer prepared to spend. With losses reducing, the Post Office is looking to the future. In south London, the Kennington Crown Post Office is being reinvented as a totally refurbished, hi-tech 'concept branch' to trial new technology, products and services in a bid to attract new customers and encourage existing ones to spend more. 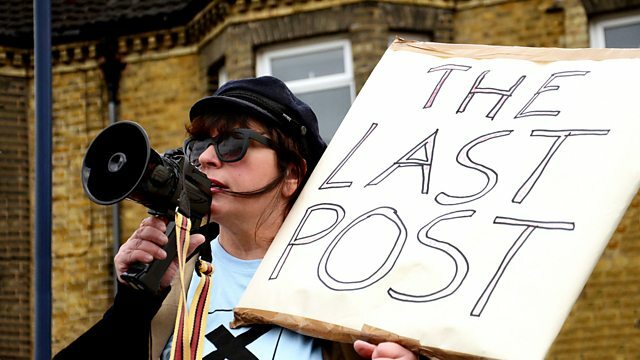 But in Whitstable, residents are taking to the streets in a last-ditch bid to stop their Crown Post Office from moving, and in rural Wales, Neil is at the sharp end of the Post Office's promise not to shut a single branch as he battles to find a way to keep village post offices open when postmasters hand in their notice or retire.